Being an International Maritime Centre, the Singapore’s maritime industry has been crucial in the development of Singapore’s economy. Constituting over 5,000 maritime companies, employing more than 170,000 people and contributing 7 percent to Singapore’s Gross Domestic Product, Singapore Registry of Ships (SRS) is also among the top 10 largest registries in the world. Seafaring is definitely a significant profession today! 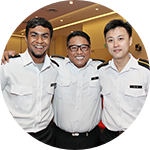 To address the acute shortage of seafarers in the growing maritime industry, the TNTA and TETA training programmes serve as a vital gateway to prepare the younger generation of seafarers for the challenging and yet rewarding seafaring career. In 2010, the TNTA was a ground-breaking programme initiated by SMOU, WSG, and NTUC’s e2i to train Singaporeans for the Certificate of Competency (CoC) Class 3 qualifications issued by MPA, thereby allowing the trainees to pursue a nautical career at sea as nautical deck officers. Today, this programme continues under the funding of SSG, MPA, SMOU and the support of partners from E2i, SSA and various shipping companies. The programme was launched to address the acute shortage of marine engineers faced by the maritime industry and after gathering feedback from the shipping companies. An entry-level 5th or 4th marine engineer can earn an average of S$4,000 per month while a Chief Engineer can earn close to S$10,000 per month. It is a good career with an excellent progressive wage model.